Twelve-year-old Sophie has always dreamed of being an actress and being in front of the camera. When that dream comes true and she's offered a T.V. commercial spot, she's over-the-moon happy. But then she finds out what exactly she'll be advertising: the delectable, ever-popular brownies from BEATRICE'S BROWNIES, which just so happns to be the number one competitor to IT'S RAINING CUPCAKES--owned by her best friend, Isabel's, family. Sophie has a tough choice to make: Follow her dreams or crush her best friend. Lisa Schroeder is the author of the teen verse novels The Day Before; I Heart You, You Haunt Me and its companion novel, Chasing Brooklyn; Far from You; and the teen prose novel Falling for You. She is also the author of the middle grade prose novels It’s Raining Cupcakes, Sprinkles and Secrets, and Frosting and Friendship. She lives in Beaverton, Oregon. 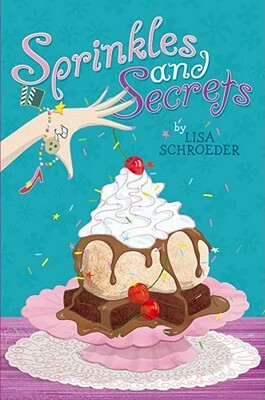 Find out more about Lisa and her books at LisaSchroederBooks.com or on Twitter at @Lisa_Schroeder.